These substations transform electricity between 132 kV, 33 kV and 11 kV. They are smaller than a National Grid substation but bigger than the final distribution substations that transform the electricity from 11 kV to the 400 V or 230 V that supplies our homes or workplaces. 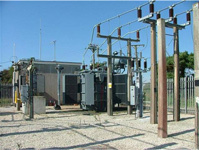 They produce fields in a similar way to a National Grid substation, only generally at a lower level reflecting the lower voltages and smaller sizes. That means that the fields from the equipment inside the substation rarely extend significantly outside the substation boundary. The highest fields usually come from the overhead lines or underground cables entering or leaving the substation.